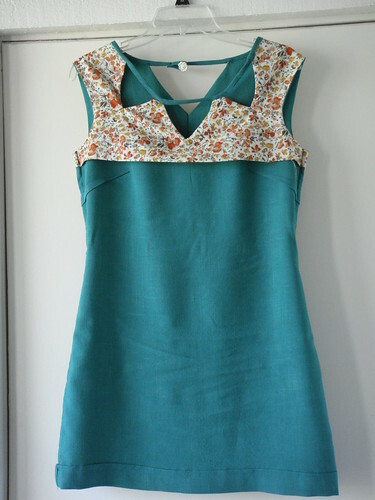 Sew Festive Handmade: Sartorial Sunday - Easter Dress Edition! Because I like to torture myself, I decided to change up my Easter dress plans at the last minute. 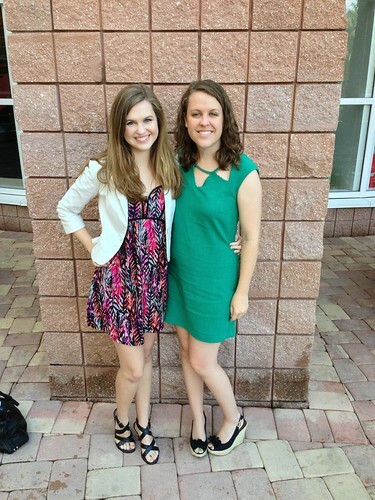 My family goes to an out-of-this-world brunch at a local resort every year, and we dress up and take pictures and pretend we're that put-together every other day of the year. Enter the Colette Laurel! 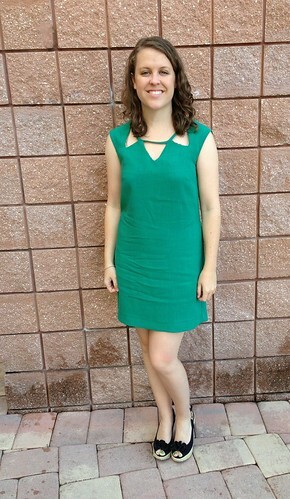 I was sold on the idea of a simple, classic dress that was easy and quick to sew, and would be a platform for variation. Because I can't seem to make a pattern as-is. Plus, you know, there's the contest running right now. I spent Saturday evening on my porch, cutting out my PDF pattern, with my trusty kitty sidekick to help eat the tape. I absolutely loved the fact that I only cut out 2 pattern pieces, plus some bias tape. Seriously. Doesn't get better than that. I knew that I wanted to use this fluid Italian linen that I had picked up at a local shop for an absolute steal. I might even go back and get more! And I knew that I wanted my version to have some pizazz, but I wasn't quite sure what that would be. I was reading Anna's blog over at Paunnet and saw the post about Deer and Doe's new spring line. BOOM. The Datura blouse. That neckline embellishment. Kismet! I drew in a lower neckline on my pattern piece and then used a diamond quilting template to draw in the triangles. I drew in one large v-shaped cutout in the center back as well. 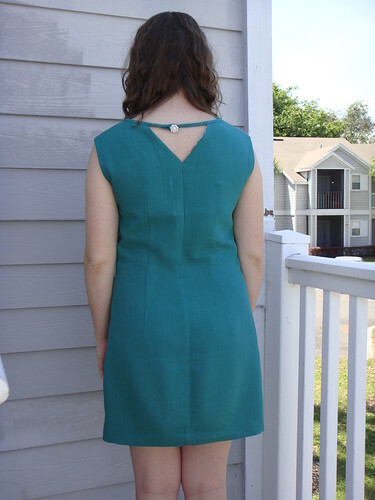 One of the versions of the Laurel is lined, but I wasn't planning to line my entire dress, so I created facings for the front and back bodice out of a Laura Gunn floral cotton. The facings actually do double duty so that I didn't have to sew bias tape to the armholes. Woo! 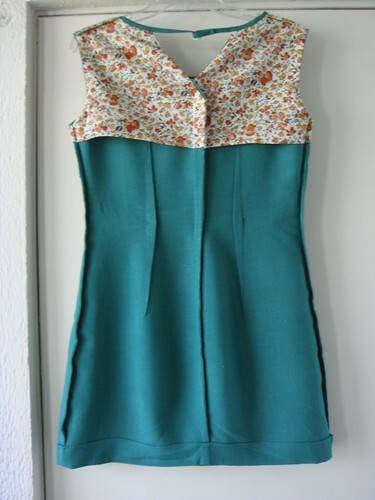 The sewing itself is very easy - bust darts, back darts, side seams, zipper. 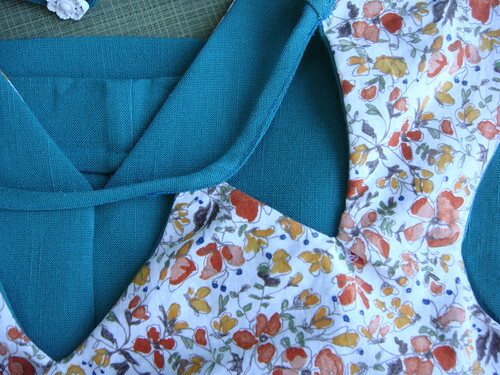 But my sewing was made more difficult by the fact that the size I cut was all wrong. I cut a straight size 8 based on my bust measurement. Because that is really the only part of the dress that is fitted, I wanted to make sure that was accurate. But the dress was enormous when I sewed it up. Seriously, I could have fit 2 of me in there. I ended up having to take about 3 inches off each side seam, and 2 inches out of the center back. That's more inches removed than my measurements call for as compared to the listed pattern sizes, so I'm a little confused. But it all turned out ok.
Another edit that I made was that I didn't include a zipper. I planned on installing it all along, and then I hit midnight and I was no longer interested in doing that. The dress slides over my head just fine. However, you would not be able to get away with the if you left the neckline as the pattern calls for it, because your head wouldn't fit. 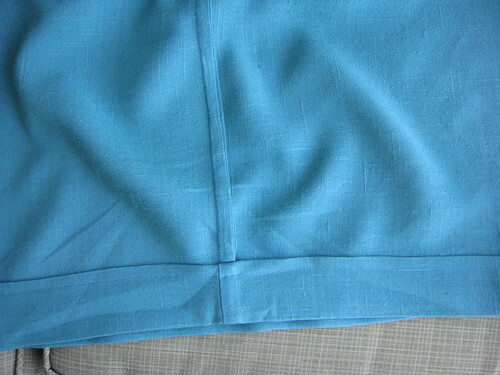 All of my seams are French seams, so there are no raw edges. It the cleanest the inside of my garments has been! 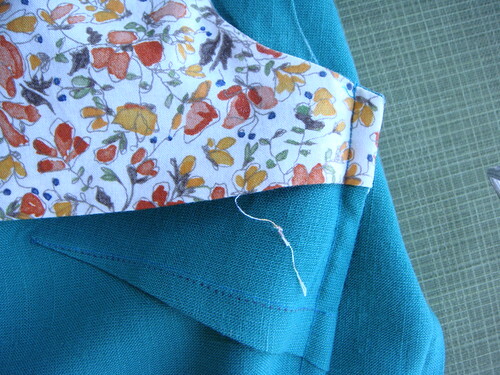 I do have to hand-stitch the bodice facings down to the dress, but I ran out of time to do it for today's brunch. I am a little concerned that the facings might show through the bodice as a wrinkle, but I think as long as I do a good job tacking them down that it will minimize the potential problem. 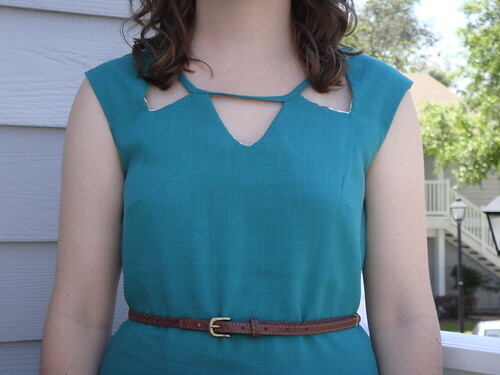 I made my own double-fold bias tape for the neckline and it's the first time I've wished that I had a bias-tape maker, because I burned my fingers no less than 57 times. Ok, maybe it was less. The back has a button from my grandmother's button stash to loop it all together. I like the 60's mini dress vibe that I get from it [I had to cut 3 inches off the hem, plus sew a deep hem, to get that look]. I don't like my terrible top-stitching skills. I like that I had thread that actually matched the linen. I don't like that I had no idea how to measure how much bias tape I'd need for the neckline, so I had to redo that maaany times to get it so that it wasn't droopy. I do like that it's figure flattering without being in your face about it. An accurate representation of the color! I don't like that I'm not sure if it's the best style for my body shape, so I added a belt [after brunch...unlimited mimosas people!]. 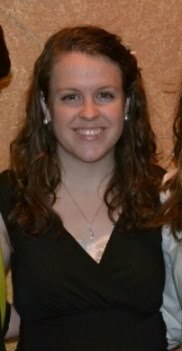 Also, sometimes the neckline looks weird in photos if I don't pay attention to my body position. Overall, I'm excited to fix my sizing issues and make some more versions. Next up, sashiko embroidery embellishments! 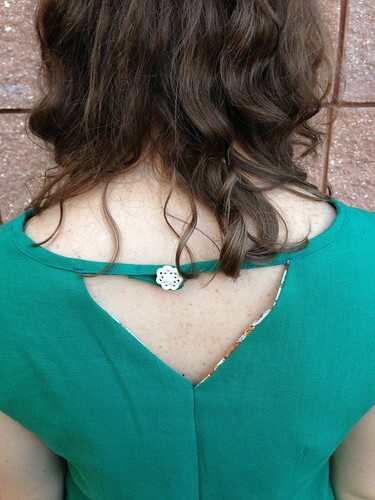 Super cute neckline! I love it--the color is amazing, and it fits you quite nicely. I can't decide if I like it with belt or without better--looks good either way. Also, cute wedges. I went shopping yesterday and almost went to DSW--but then didn't, as I knew no good would come of it. Here's something I've heard works better but haven't tried yet - when picking your pattern size, go by your overbust measurement instead of your full bust. You can always do a FBA or SBA to make up the difference in size, but often our bust size doesn't correlate with our waist and hip measurements. Awesome save though, it looks great on you! The neckline reminds me of a string of bunting. This dress is lovely: the cut and the colour. I absolutely adore this on you! Well done! Looks lovely, well done. The changed neckline is a great enhancement. i love your neckline variation. 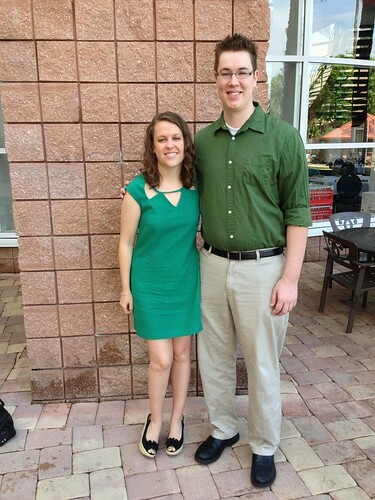 your dress is gorgeous and the perfect shade of green. I love this! It's my favorite of the entries thus far. 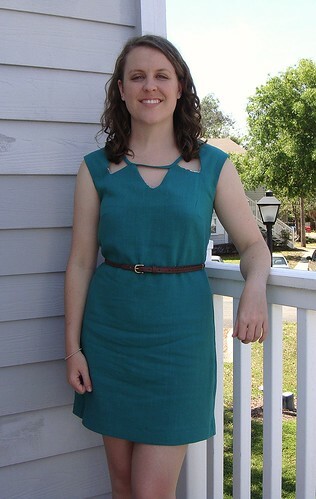 The Colette Laurel contest has also altered all my sewing plans for this month and it's good to know I was not the only one with fitting issues (seriously, did the same thing you did--cut out an 8, took the body into a 6, but still had to take 3 inches off the waist, lowered neckline). But once you know how to fit it, it's awesome!